Kidical Mass is a monthly bike ride for kids, families, and kids at heart. This month we're taking the Flume Line Trail (formerly known as the Water Ditch Trail) south towards Arlington Elementary to check out some improvements and additions to this multi-use path. We've done this route twice before and it's great to see our city's bicycle infrastructure improve and expand. If the group is ambitious, we may venture over to the STAR Center on South 66th Street. 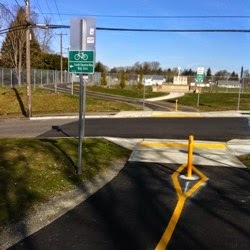 Either way, we will return to South Park via Puget Sound Avenue (riding in the street!) for snacks and more play time. Helmets are required and young riders should bring a grown-up. Contact the ride leader (Matt) for more info: kidicalmasstacoma <at> gmail <dot> com or 25three-2zero9-403two.